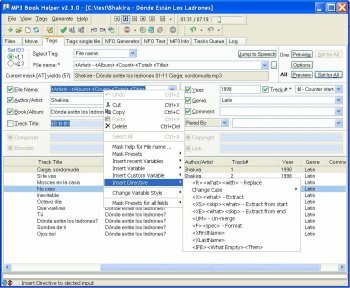 MP3 Book Helper provides rapid MP3 (ID3v1, ID3v2) and Ogg Vorbis tags editing and file renaming. Mass Tag editing is done using special variables and Regular Expressions. Undo and preview for all changes, capitalization, search and replace, use parts of file name or directory structure for tags, all customizable and configurable. Play your MP3 files in Winamp while editing Tags. It will auto pause and resume Winamp when renaming or updating files. It can also be used to easily create WinAmp-compatible playlists (M3U files), Information (NFO) files, Parity archive (PAR) data recovery files and Simple File Verify (SFV) checksum files. You can export and import ID3 tags to and from comma delimited text files, verify CRC/MD5 checksums and more. Absolutely best tagger. Because it doesn't add its name in MP3's, is standards compliant, is customizable, bug free and etc. I wish it was still developed because all of the other tag editors are either lacking important features or buggy. Only thing I miss is the synchronised lyrics support. This is one powerful utility! I tried various other tools (some are commercial tools) in an attempt to batch edit tags and none was capable of accomplishing what I wanted. Then, I found out about this free tool. The tool offers lots of options but what I especially liked and couldn't find in other tools is the power and flexibility of the variables support for defining filename-tag associations. It might be a little bit too complex to use for some people but if you care to spend some time to learn how to use it correctly, you'll find its power. By the way, in response to the folk who complained he couldn't load all his audio files, well did you check the "with subdir" checkbox? Unless you have your audio files scattered all over the place, you can simply select the parent folder and check the checkbox. The tool would load all your mp3 files in all subfolders. This is by far the best mp3 tagging tool I've ever seen, even compared to commercial apps. Its very flexible renaming and tagging functions work like a charm. The built-in preview allows you to see every change you make and if you're still not happy with the result you can still undo it. It has dozens of other functions and a highly flexible GUI. This program is quite nice, but TagScanner is much better. I switched to this one when MP3Tag changed from free to shareware, and have been quite happy with it. It doesn't handle album art or lyrics yet and may be in danger of becoming a bit bloated, but is developing very quickly, and already has more features than would be necessary for my use. I've also used TagScanner, but prefer the MP3 Book Helper interface.